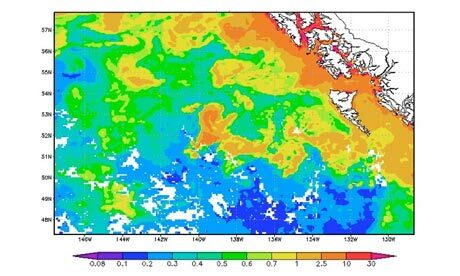 In July, approximately 100 tonnes of iron sulphate was dumped 370 km off the coast of Haida Gwaii, into the Pacific Ocean. It is being described as “the world’s biggest geoengineering experiment”. Increasing levels of iron sulphate in the ocean was done for the lucrative carbon credits and the possibility of enhancing the oceanic conditions for plankton growth, which promotes a healthier environment for fish. Plankton blooms can also absorb more carbon dioxide – the main greenhouse gas associated with climate change. The dump did contribute to a plankton bloom 10,000 square km in size, which appears in the satellite image above. How much of the bloom is naturally occurring and how much is as a direct result of the dump is yet to be determined. Behind the operation was a man named Russ George, the former executive director of Planktos Inc. He negotiated with the Haida Salmon Restoration Corporation (HSRC) to launch the project. Billed as a salmon project, the HSRC agreed to channel more than $2.5 million into it. George has tried to push carbon credit schemes in other parts of the world as well, particularly in Spain and Ecuador. Environment Canada’s Enforcement Branch is currently investigating the incident.